Of the physical spaces which a themed area can inhabit, the most difficult is the vertical. Horizontal space may be cheated to expand into the horizon, recede close to the spectator, twist into engaging patterns, or exist as flat, vacant space. Horizontal space can be designed - it is a choice between placing an object/building/tree in a certain space... or not. But vertical space must be built up. And so Disney has developed various methods of creating an artificial vertical space. There is not for nothing a projection of clouds on the ceiling of Pirates of the Caribbean - it is a simple depth trick which obscures the actual vertical height of the room. It expands space. One of the most unique aesthetic features of the output of WED's "Golden Age" is the deployment of skylights and what vertical space they intend to create, and even stranger, the deployment of false skylights and what vertical space they intend to create. The above image shows skylights (false ones) outside (from left to right) Pirates of the Caribbean, inside Columbia Harbor House, and finally inside Pinocchio Village Haus. 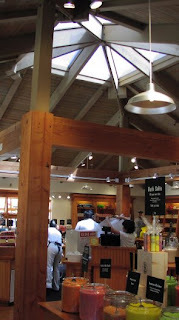 There is also a second set of "skylights" in Columbia Harbor House's serving area, which links Harbor House and Village Haus with some strange, opaque connection. To my eye, the Pirates of the Caribbean ones are probably the most successful false skylights in the entire park, possibly owing to the fact that the attraction was built two years after the rest of the park and thus the designers had a better handle on what did and didn't work. More likely it is because the entire plaza area is designed to appear as if it is opening up to something; all of those bands of wood thrusting upwards towards the light; and because there is no height cheating, e.g. the structure's height you see outside is the same as the skylights you see inside. In terms of making an area bright and cheerful, even at night, it's hard to argue with these simple lights. Much less successful are the Harbor House lights, which seem to me to be deployed sloppily in order to convince the diner that she is eating in a mess hall inside a ship. Since you can stand above this room in the same cafeteria, these have transparently been deployed for purely aesthetic effect, much like the entrance hall lights in The Hall of Presidents (right). Although both could probably pass for actual skylights, they make no effort to convince, and although the resulting effect is stately, it is not actually successful. And compared to Pirates and other examples, these skylights are as abstract as those found in Village Haus, which are the most purely visual abstraction of "the sky" found in any Disney park. They are also the least appealing "false skylights" to be found anywhere, making the area look less like a European tavern and more like the cafeteria it is. Furthermore in Village Haus only, perhaps, does it become transparent why exactly this particular architectural feature was invented in the first place: it's a vaguely pleasing way to hide flourescents. And so, from abstraction, let us travel on into pure trickery, found in Adventureland. 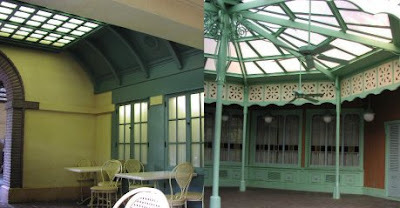 Both photos below are from the outdoor seating area of the Adventureland Veranda, but one is a real skylight and the other is false. It shouldn't be too difficult to determine which is which, but the crucial point here is that both are to be found in the outdoor areas designed as the most remote seating for a Magic Kingdom eateries, and both are, in viewer effect, more or less identical. The first, especially, placed in an area likely to get sun from all sides, may be the most subtle in the Magic Kingdom, truly blending the line between inside and outside spaces. Rather than transforming day into night, as in Pirates of the Caribbean, here WED appears to be attempting to transform night into day - a far less likely to succeed and abstract concept, but here they are, making inside lights outside lights with nothing but a turquoise box and some frosted glass. The full extent of how successful this strategy is becomes apparent when you look at authentic skylights in the same park and realize that the methods of their application are, essentially, identical. Here's skylights - real ones - from the Plaza Pavilion (Tomorrowland Terrace), Crystal Palace and Town Square Cafe (now Tony's). 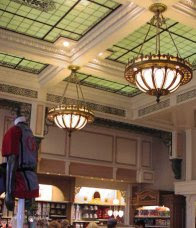 Notice that, especially at the Terrace, that the placement, effect, and features of the skylights are such that they might as well have been artificially illuminated, as in Columbia Harbor House. Disney seems to be using these as an signifier of class and luxury, which is why most appear in eateries, a setting most Americans want to feel sophisticated in, even on vacation. A skylight is an easy way to simply and effectively "class up" a barren area, reducing the sense of enclosure and artificiality. Let's not forget that Crystal Palace was once a high-end eatery and that King Stefan's Banquet Hall, while lacking skylights real or imagined, does feature very large floor to ceiling windows. So when did all this nonsense start? don't tell anyone - it's a secret! 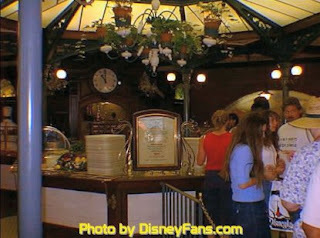 Left is an interior of the skylight-rich Lake Buena Vista Shopping Village, now known as Disney Marketplace, and for many years the store you see was known as Port of Entry. Many of the original Lake Buena Vista buildings prominently featured skylights as key aesthetic features, expanding space up as well as providing a reasonably innovative shopping experience. The faux-chalet interiors of these small and unpretentious buildings are still comfortingly human-scale today, and show more good design sense than much of, say, The All Star Sports or Coronado Springs. Let's not forget those skylights in the concourse of the Contemporary and the lobby of the Polynesian, in The Land at EPCOT Center, and, of course, the entire Journey into Imagination development. Skylights, real or fake, meant a classy establishment. The trend continues today. Above is the Emporium Expansion, built in 2000, almost thirty years after the park opened, but we see WDI remarkably following the aesthetic template WED favored, by placing false skylights in any area intended to be classy and expansive, day or night. A variation has evolved. 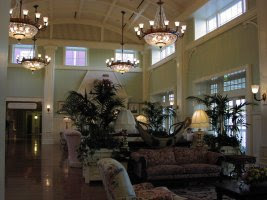 When the Lake Buena Vista Village Golf Club became The Disney Institute in 1994, a huge new reception area was built which featured, not skylights at the top, but windows on all sides which served essentially the same purpose. Wilderness Lodge has both skylights and huge glass walls, and The Boardwalk (right) accents its' huge brass light fixtures with high windows which allow sunlight to flood in in much the same way as skylights do. And when the Grand Floridian was built in 1989, all that white and red had not only entire walls of glass to make sure that everyone knew it was extra classy, but, perversely, false skylight domes. Disney wasn't leaving anything to chance. I know I'm missing a number of extinct or obscure false skylights here, but short of developing an actual thesis about this, I'd like to sum this long-in-development article by saying that this is but one of thousands of naggingly fascinating details integrated into Walt Disney World with surprising accuracy and frequency, from 1971 to today. And one final thing: anybody notice that, with no exceptions, that all of the false skylights are clustered on the West Side of the Magic Kingdom? 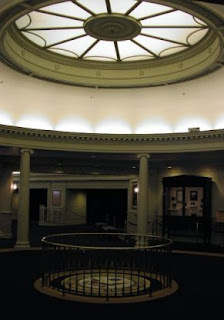 Excellent photo essay and analysis on the skylight trend at WDW. Again, something I never really thought about but has always been there. Much appreciated. I love the transitions in that attraction. Most of the entrance (with the skylights) is fairly open on three sides, which during the day, would add to the effect. But, when you go inside and the light levels are suddenly dropped, you immediately get the sensation of being in another place and another time. I still think it is one of the finest queues for mood and ambience that had been done (with the exception of the Indian Jones Adventure in Disneyland). I have not had the opportunity to check out the skylights at night, but I bet the effect is the same: a transition from bright and airy to a Caribbean style fort. It works surprisingly well at night. The thing I think is interestiong is that it's an extension of the Disneyland "simulated sunset" (because that's what walking from a 'daytime' to a 'nightime' is). At Disneyland you go around a corner and under an arch, which is brilliant, and at WDW you kinda go up a ramp and under many arches, but here the transition will work 24 hours a day because the 'daylight' is forced! I think Disneyland's is a little more magical, is only because it's actually a little more subtle! Great queue ay Pirates, though. Really stunning stuff and the first of its' kind. I was talking to my brother about the differences in Disneyland and WDW. I had to say that I really enjoyed Pirates at Disneyland because of the Blue Bayou and the extended cave sequence. Also, the uphill waterfall is wonderful, once you realize you are going up a waterfall. I guess that is why I enjoy yours and Jeff's blog (2719 Hyperion) so much. As much of a Disney Geek as I am, I still miss so many things. I will be looking at this when I go to Disney here a week.That's something I never though about and it's really neat.I have learned something new again today about WDW.